Whisky likely first found its way to Hong Kong during the British colonialism of the mid 1800's, and more recently whisky has grown to a $57.9 million dollar market in China, a 36% increase from 2016. One of the most popular ways to drink whisky in China and other parts of Asia is mixed in a tall pitcher of tea. Whisky and tea together, outside of a hot toddy, may seem foreign to the western palate, but the paring seems inevitable given the ubiquity of tea in China and other Asian cultures. Fine teas have all the subtlety, nuance and finesse that fine whiskies possess, so it's no surprise that all those tasting notes play well together. Paul Benjamin, founder of Benjamin & Blum, was so inspired by this pairing that he started the luxury bottled tea brand. His beautifully packaged, high quality teas are specifically made to be mixed with whisky. This cocktail, The Hong Kong Old Fashioned is a riff on the popular Chinese tipple, that combines the tea and whisky elements together with infusion. 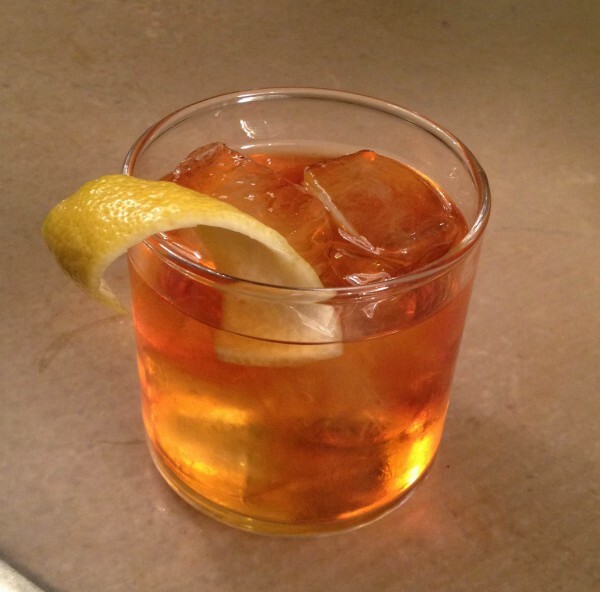 It's all the flavors of whisky and tea together in the slow-sipping format of an old fashioned. Infusing a spirit with tea is easy and fast, it can almost be made to order. While some ingredients take hours or days to release their flavors into alcohol, infusing tea doesn't take much longer than making a cup of tea—about five or ten minutes depending on the tea you're using and the proof of the spirit. The sweet and floral elements of the drink's other modifiers can bring out delightful notes in both the whisky and the tea, depending on which blend you use. For this specific recipe, I wanted to emulate the flavors of popular bottled and canned iced tea, but feel free to experiment with different combinations whiskies and teas. A peaty Islay with an old Pu Erh? The possibilities are endless. Stir all ingredients over ice until well chilled and strain into a rocks glass with fresh ice. Garnish with an expressed lemon zest. *For the tea infused whisky: Steep a jasmine green tea bag in the 2oz of whisky to taste(about five minutes). Taste as it steeps, as over steeping will cause bitter flavors. You can also make a larger batch with more tea bags. Note: This cocktail is caffeinated.